As the saying goes “Natural Born Leader” women have been supporting organizations in leading roles across many diverse industries globally. 1. 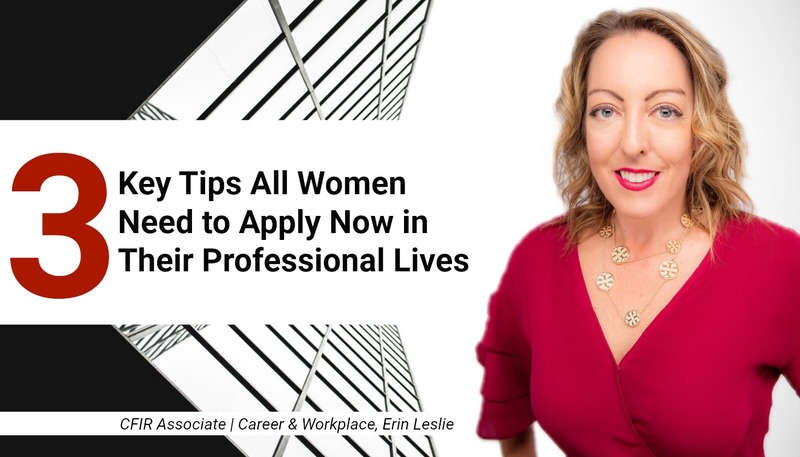 When looking for key roles make sure to take into account lifestyle preferences and balances that give time for you to look after yourself and your loved ones. Don’t just accept the next leadership role because it means you will have the title and responsibility. You need time to be mindful of your own needs and healthy approach to re-energizing. 2. Do you hear yourself saying “I can’t apply on that job” because you think you don’t fill 80% of the job posting criteria? Stop self-doubt now! Do you like the position description? Great! Now, look at how your past experience can contribute and build the narrative around how your experience makes you the ideal candidate for the job. 3. Be mindful about negative energy and the impacts it has on your stress levels and body. There are times when we catch ourselves judging a project or adverse performance/outcomes without having all the facts. Remember that you never know what people are genuinely going through in their lives that would cause professional impacts on their work. Be supportive and an active listener. You may uncover some key insights to help move the situation back onto a successful pathway. Thank someone today for their professional services and happy International Women’s Day. 1. Vast Clinical Experience – Psychologists at CFIR are skilled professionals ready to address the cognitive, emotional, behavioural, interpersonal and socio-cultural dimensions of your concerns. 2. Location – 790 Bay Street is a medical office building located in the heart of downtown Toronto. CFIR is now just steps from major downtown hospitals including Women’s College Hospital, Mount Sinai Hospital, Sick Kids Hosptial. We're also in very close proximity to College Subway Station, and buses as well as the PATH (our underground walkway through the business district). On-site and underground paid parking is available. 3. Broad and Flexible Treatment Options - We believe it is crucial for your clinician to be able to be flexible in offering a variety of scientific, evidence-based treatments to address the various facets of your concerns. No one treatment fits all, so we provide you with different possibilities. At CFIR, we take an integrative approach to treatment, to ensure we tailor them to each client's needs. 6. Coverage by Most Insurance Plans - Private extended insurance plans (as well as Medavie/BlueCross (RCMP, Veterans Affairs, Canadian Armed Forces) and CUPE) provide coverage for CFIR services. Our Psychologists are approved providers of the Canadian Interim Federal Health Program (IFHP) for Refugees. CFIR clinicians will conduct a comprehensive assessment to identify the factors that have contributed to your concerns. The assessment is followed up with a treatment plan to address your issues and provide you with a sense of the treatment duration, and what type of progress and change you can expect over time. 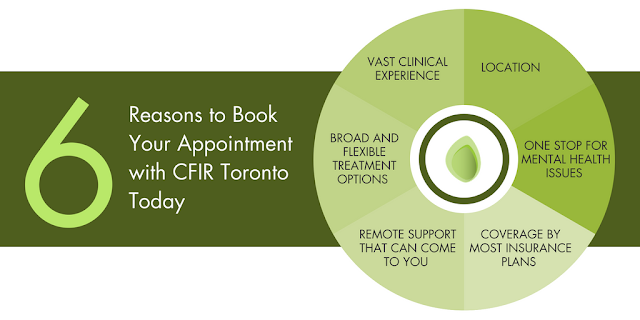 There you have it, six solid reasons to book your initial appointment at CFIR - Toronto today. With offices in Toronto and Ottawa, we’ll get you started on your journey towards positive change. Click here to request your session. *SecureVideo Telepsychology Services are only available for Ontario residents.